Something magical happens when a full moon appears over Aravaipa Canyon in Arizona. Animals from air, land, and sea come together to dance, sing, and make music at the “critter ball.” With ethereal illustrations awash in purple hues, second graders will love this gentle rhyming story of friendship, camaraderie, and celebration of nature. At the monthly moonlit dance by the creek, frogs and bugs exchange hugs, while bobcats croon and porcupines whistle a tune. Snakes shake their rattles, gila monsters swish, and silver minnows shimmer as they splash, while brown bears do-si-do and quails tango all under the watchful eye of the moon. Cheek to cheek, paw in paw, they dance the night away. No one wants it to end, but at daybreak the animals vanish. All that remains are hoof prints, paw prints, feathers and flower petals curiously mixed together, along with a message inscribed in the sand: The moon saw it all! Recommended for ages 3-9, this book is chock-full of warm fuzzies; the soothing cadence is a natural fit for a bedtime story or classroom read-aloud. Every page offers an array of critters to gaze upon, plus children outside of the southwest will learn about regional species such as bighorn sheep, javelina, tarantulas, and coatimundi. A curriculum guide for school or home use follows the story and includes vocabulary words, lessons on poetry, and literary activities. 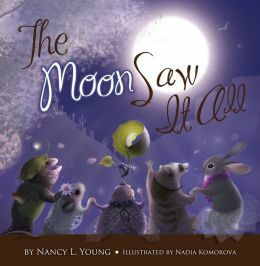 A companion coloring book, The Moon Colors It All, can be purchased on www.MoonSawItAll.com. Visit the publisher’s website for additional titles: www.LittleFiveStar.com. 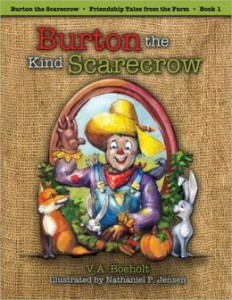 Burton the scarecrow wants to help everyone. His job is to protect the crops in Farmer Green’s garden. Even though the near-by animals and birds could damage the growing things, Burton finds a way to help them stay warm during the cold winter months. Instead of a pumpkin for the mice, Burton gives them his hat. Instead of the bean vines for the crows, Burton gives them his overalls. Instead of rhubarb leaves for the bunnies, Burton gives them his jacket. Then the fields are harvested and, as winter arrives, Burton is alone. Without his clothes and most of his straw, he falls from the wooden frame and lies in the snow. When spring comes, Farmer Greene sees Burton in disrepair and decides that he has to replace the old scarecrow. The animals overhear and they are moved to help the fellow who helped them so much. Not only do they bring clean clothes and straw for Burton, but they bring enough clothes and straw to make a scarecrow friend. Burton has a lady friend to keep him company. Farmer Greene is quite surprised at this turn of events and feels that he can begin the spring planting with such good scarecrows to keep an eye on things. A sweet story about how kindness given comes back to the giver. The colorful, cheerful illustrations complement the text especially with the characters’ facial expressions. There is a history of scarecrows section, as well as a resource guide for parents, teachers, and librarians including story concepts, reader and listener tips, connecting points, ideas for literacy activities, glossary and a list of suggested websites. A good selection for a Character Counts read aloud. While not obviously religious, it could also be used in a Sunday School class or parochial school.